A cacophony of geology, planetary science, geek jokes, lego, gaming and cult TV obsessing. SXR339 – Walls, Wolves Rock, and Rain! I’ve been working on my assessment (TMA) for this module so writing about it here has taken a back seat. However, I promised more pictures! 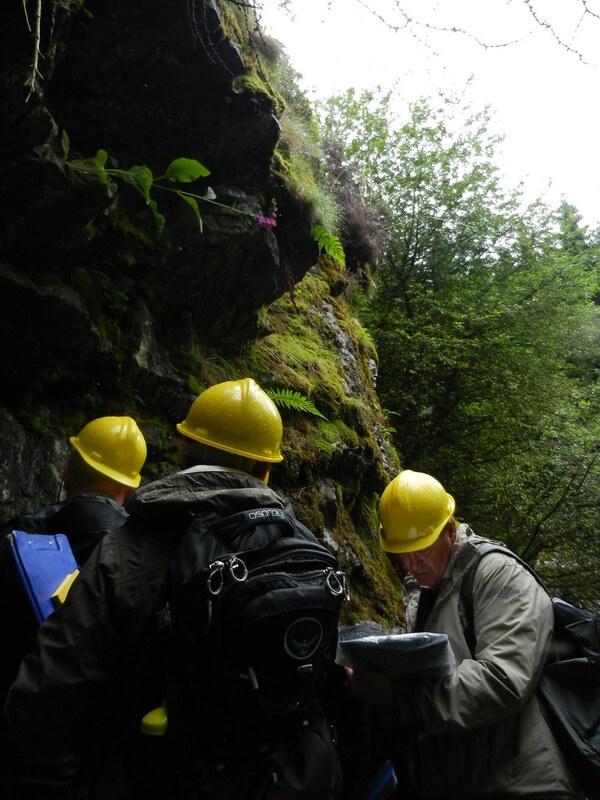 On Monday we spent most of the day at the field centre in Kindrogan, doing petrology labs and listening to a lecture on metamorphism. 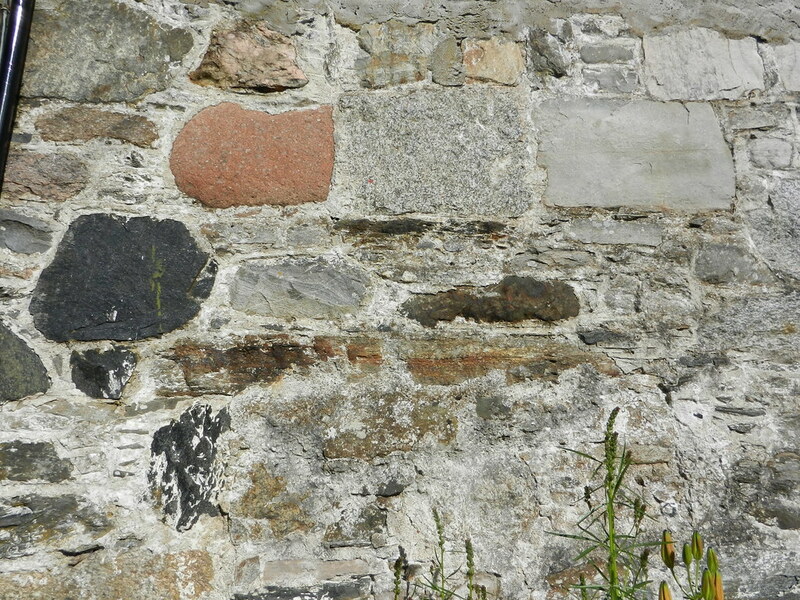 During one of our tea-breaks I spotted this wall outside the field centre. 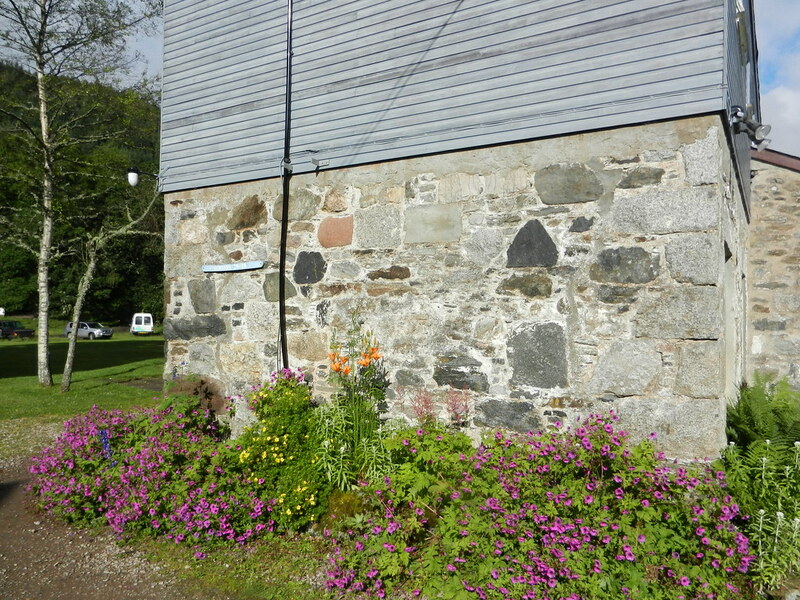 The wall of the field centre at Kindrogan, built of loads of different rock lithologies. Every block of stone in this wall was made of a different type of rock, it was really interesting. I wonder where they got all the stones from? That afternoon, it decided to chuck it down with rain. I know, it looks like nice weather in the pictures above, but that’s Scottish weather for you 😛 It changed more often than the wind. So we waterproofed up (note the yellow hats for safety – just don’t tilt your head back or the rain all runs down your neck! ), and headed uphill through the muddy, slippery Kindrogan wood to take a look at Wolves Rock. It was only around 15 minutes walk away, but extremely boggy, at least it was raining for full effect. 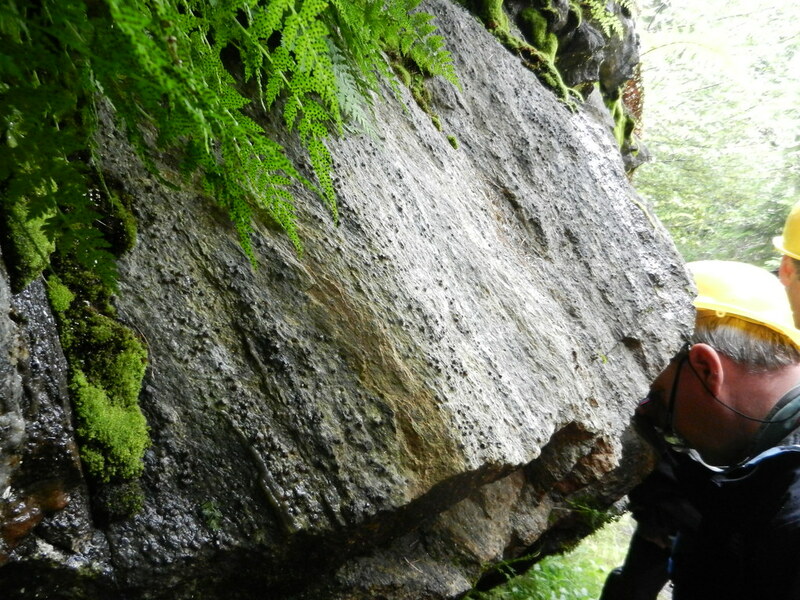 “Why, oh why, did you climb all the way up there to look at some moss-covered old boulder?”, I can hear you thinking. “There are no intricate folds or huge deformation features here.” Wolves rock is essentially just a fallen block which has detached itself from the main rock face further up the hill – the Pitlochry Schists which form the base of the Upper Dalradian (in this area of Scotland). The interesting thing about it is that metamorphism has formed these…. 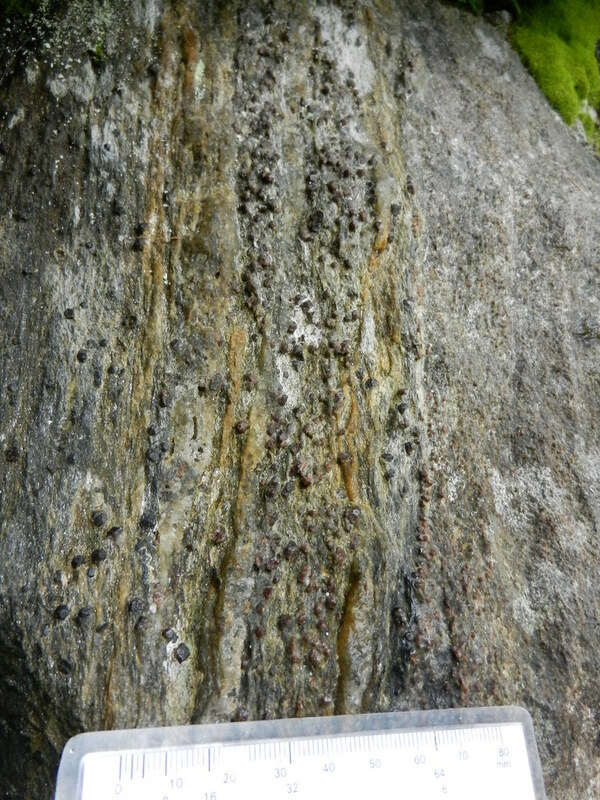 Garnets strewn through wolves rock, tons of them! 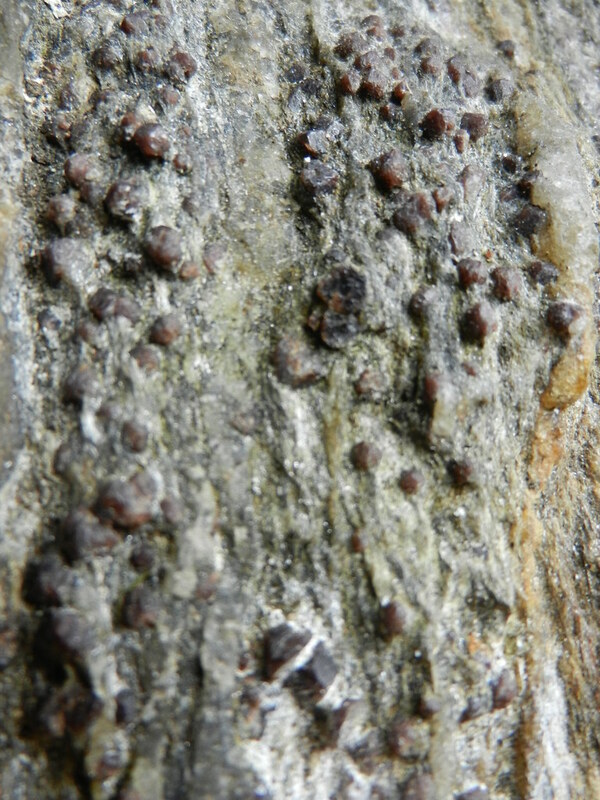 Garnets next to a scale with 1mm increments. They are incredibly easy to spot in-situ (and in thin section, due to being isotropic!) due to the dodecahedral shape and dark-red colour. We had to work out the relationship between the mineral growth and the fabric. After the job was done – we hurried to finish as the rain began to get even heavier – we packed our stuff and started our descent back through Kindrogan wood. Going down was much more fun than going up, due to the slippiness – although the trees were handy to balance yourself with. I lost my footing a few times, while the woman walking in front of me fell on her arse, but managed to catch herself before sliding anywhere. I wished I had a plastic sheet so I could have just slid down through the muck!